Was the KLM route doing well before the airport closed? KLM operated AMS-MSE for just 13x months from April 2013 to April 2014 - 2x daily with Fokker 70 aircraft, until the airport closed all of a sudden. The airline carried over 48.000 passengers on the route or about 4.000 per month, which averages to just under 40 pax/flight. If MSE were to re-open, it is unlikely KLM will re-open the route, as slots at AMS are scarce. The airline is already dropping frequencies to Northern UK destinations in S18, to increase frequencies elsewhere in the network and to open AMS-Vaxjo and AMS-Nantes. My maths has it at 64 pax per flight. It was my understanding that KLM liked this flight as it was a high yield, no competition feeder route for them considering it was 20-25minute flight. Regardless of recent statements made by Ryanair and their plans for Manston which are fairly plausible especially considering that they lack any real coverage of the southeast market south of the Thames but I feel Manston is a dead duck it won't reopen it's days as an airport is well and truly over and all this talk by the current owners about reopening the airport is just a pipe dream. The Manston site will eventually end up as housing as already plans are moving forward in that direction something that is in dire need in that part of the country. Ryanair could always look at Lydd for future expansion south of the Thames where they already have planning permission for a runway extension, new apron and a new terminal but so far none of those plans have come to anything, perhaps with a commitment by Ryanair those plans could move forward as it's just as isolated as Manston. 94 Countries, 327 Destinations Worldwide, 32 Airlines, 29 Aircraft Types, 182 Airports, 335 Flights. Air India revise their Delhi/Amritsar service on Tuesday (as per other threads) with Tuesday 20 February seeing direct Amritsar AI116/7 start twice weekly (Thursday the other direct day). This is not an increase as Delhi direct goes from daily to 5 a week. Uzbekistan Airways are also rumoured to be announcing a comeback, no doubt trying to steal some away of the traffic heading to ATQ. Turkmenistan Airlines are sending another 777 today and with Air India switching to add ATQ direct twice a week there is obviously high demand. Turkish are also reportedly looking at ATQ as well. The A350 has been confirmed for QR at EDI. It’s bookable already. Rossiya Airlines to operate St. Petersburg to Gatwick 1x daily with A319 aircraft from March 25th. Will operate using Aeroflot flight number according to a tweet from the chap who runs the airlineroute blog. Loganair to end their MME-ABZ flights. At least Eastern T3 should base a Saab 2000 at MME now. However, we shall see what happens. Had no idea in all honesty - thanks for that. I seem to vaguely recall Rossiya operating this route some years ago unless I'm mistaken. Rossiya previously operated St Petersburg to LGW prior to Transero taking up the route and before that it was Pulkovo Aviation. Back in the heyday of Russian charters in the late 70's to mid 80's LGW would often see upto 3 sometimes 4 Aeroflot flights on a Saturday from St Petersburg or Leningrad as it was known back then by a mix of TU-134/TU-154,IL-62. AY sees potential for more flights to the UK. The message about the Asian connections is also catching on in the UK. Up to half of all Finnair passengers from the UK connect to another flight at Helsinki. As well as the London connection, Finnair serves Manchester twice daily and Edinburgh nine times a week. There is more to come – Edinburgh goes year-round from March and Jarvinen says double daily from the Scottish capital is a target, and Birmingham “is definitely on our radar”. Yeah it wouldn't surprise me if they announced BHX within a year. Brexit - It’s time for global Britain. Flybe are planning to add a 4th based aircraft to their Cardiff base potentially for Summer 2019 and are looking at new routes to Spain, the UK, Germany and Italy. The base for 2018 will be 3 aircraft 2 E195s and 1 E175 until the end of June then it'll become 1 E195 and 2 E175s from then on. Also Thomas Cook have added a 1 weekly Enfidha on Wednesdays for Summer 2019. 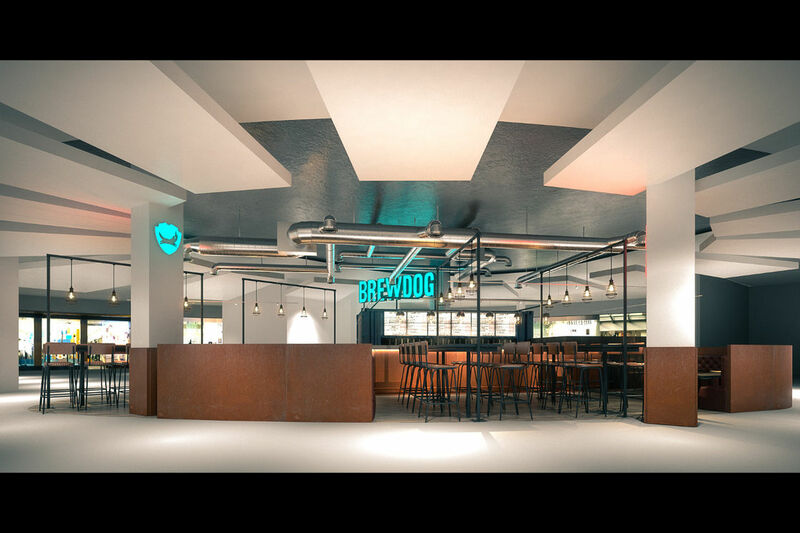 Scottish brewer, BrewDog are going to be opening up bars at Edinburgh & Manchester airports (as well as Barcelona). Scotland’s busiest airport is expanding into a new extension, reaching out from the east end of the airside terminal. And we can announce today that one of those units will be ours; BrewDog Edinburgh Airport will be taking off very soon. We believe airport bars should serve amazing beer, in the right way, in a location you want to be in rather than one you head to as the only resort. Loganair to replace Ryanair on the domestic GLA-LDY route, following Ryanair's upcoming closure of the Glasgow base. BMI Regional are to 'temporarily' suspend MUN to SOU from the end of the IATA winter schedule on the 25 March 2018 due to 'staffing issues' according to a statement released by BMI. It's a shame as I was hoping that BMI would eventually expand their presence at SOU to the likes of Brussels, Copenhagen, Frankfurt, Milan and Zurich as there the type of niche airline that SOU needs. Airlineroute.net tweeted today that Tinajin Airlines, Xian-Tianjin-London (Gatwick) route is now going to operate to/from London Heathrow instead as of May 2018. Twice weekly with A330-200 aircraft. These days there seems to be a lot of fresh Chinese routes turning up at LHR. As of Monday the Bmi regional LDY-STN route is operated by an Eastern Airways Saab 2000 instead of an EMB 145, while Eastern Airways is wet leasing Bmi regional to use EMB135/145 on the ABZ-NWI route. MME-ABZ will continue to see the Saab 2000 from T3 once Loganair pull out. Currently rumors within T3 are stating that an EMB 145 could be the based A/C at MME. A J41 will be replaced at NCL by an EMB 135, currently in service in Nigeria operating for Bristows helicopters. G-CHMR EMB 145 is soon to be replaced by sister ship to G-CISK (I will know the reg soon) an ex areo Mexico aircraft. G-CIXW currently in AMS for inspection after a hard landing 2.3G.the A/C operates for BA cityflyer on flights from LCY to LIN and RTM, however this is changeable. That's a real bummer for LGW and a dent to the airports Chinese destination portfolio. Now with Hainan shortly starting LHR to Qingdao and with this announcement that Xi'an will also be from LHR I wonder how long Tianjin Airlines will remain at LGW, but hopefully their current flights from the airport to Chongqing and Tianjin will continue. The loss of Xi'an is a shame but at the end of the day the route hadn't already started yet so in reality it's not as if LGW has lost a route or another long haul airline to LHR and at least for now Tianjin Airlines are still at the airport. Israeli carrier Israir Airlines and Tourism Ltd. is launching new direct routes from Tel Aviv to Scotland and Norway in June. Israir will operate weekly flights from Ben Gurion airport to Edinburgh in Scotland, and Oslo and Bergen in Norway. Tel Aviv - Edinburgh flights will begin on June 13 with fares beginning from $650 return. Flight and car hire packages begin from $855 and 8-day organized tours start from $1,600. Carlisle or "Lake District Airport" will receive Logonair services. "Loganair will operate eight flights per-day across the working week and a total of 12 at weekends, connecting Cumbria and the Lake District, which receives 45 million visitors per year, to London Southend Airport, Belfast City Airport and Dublin Airport"
Advised at work today that Med-view Airlines have suspended ops at Gatwick with immediate effect. I'm not aware of the reasons why at this time, but I've been further advised that the airline is looking to recommence ops again from May 2018. I've been advised today that Med-view Airlines have suspended ops at Gatwick with immediate effect. I'm not aware of the reasons why at this time, but I've been further advised that the airline is looking to recommence ops again from May 2018. The suspension of Med View Airlines LGW to LOS is probably down to the fact that their B777 used on route has apparently been taken back by it's lessor Air Atlanta. Hopefully the airline can secure an alternative aircraft in time for their planned resumption of services in May 2018. Regarding LGW and Nigeria, the Nigerian airline Peace Air have recently received their first B777 and they have indicated that there interested in flying to LGW so hopefully the airport won't lose their sole link to Nigeria for long. The new airbridge at Cardiff Airport has been fitted now. Also the stands in that area will be reconfigured with 2 new ones 7L and 8R being created with 7L being the wide body stand. 8R will be inbetween 8 and 7 and stand 7 will be moved up a bit. Also the Welsh government will invest £6 million more into the airport in return for more equity. More terminal building upgrades have been mentioned along with a logistics hub. Also not sure if this has been posted but Thomas Cook will bring back Enfidha Tunisia for Summer 2019 it'll be 1 weekly every Wednesday morning. I was under the impression that Cardiff Airport purchased two former AirBridges from LGW, are they intending on installing the other one as well to replace one of the other two delapitated AirBridges. Yes they did buy 2. The latest info i have on the other one is that it'll replace the condemned bridge on stand 9 so KLM and Flybe can use it and the current bridge on stand 10 will be refurbished. That work is supposedly to be done next winter but apparently there is a small chance it could be done sooner. When you hear the noise of the Tartan Army Boys, we'll be coming down the road! Yes having 3 working airbridges is a good selling point for CWL, I'm pretty sure that CWL is passenger numbers wise the smallest airport in the UK to have them and with the airport getting busier each year with more new routes to Dubrovnik, Naples, Antalya, Enfidha and Hurghada to come and Venice starting today and extra based aircraft from TUI in 2019 and rumours Flybe might base a 4th aircraft in 2019 as well then they aren't going to be under used! In other UK related news, the future of Plymouth City Airport is to be decided this year. There are proposals to tear up the remainder of the airport to build new homes but opposition has emerged with many people saying that the airport is a vital piece of infrastructure and should be reopened. I think PLH has potential to sustain airline service, particularly to Manchester, Dublin, London and Glasgow/Edinburgh. Plymouth and it's local area have long suffered from long journey times to the rest of the country and indeed the world which makes it a less attractive place to do business. PLH does suffer from a short runway but land to the east could be built on in the long term if they can hush the NIMBYs. Good luck with that but I feel that the days of Plymouth having it's own airport again is long gone regardless of ''many people saying that the airport is a vital piece of infrastructure and should be reopened'', I should imagine in all reality that ''many'' actually means a few! Qatar Airways inaugural flight to Cardiff Airport will be with an A350 900 and then a 787 8 from then on. This is what Summer 2019 looks like for CWL at the moment. All flights look like they are on TUI aircraft. Palma de Mallorca 7 weekly Monday, Tuesday x2, Friday x2, Saturday and Sunday increase of 1 weekly flight. In summary TUI Summer 2019 is 3 based aircraft, Paphos, Corfu, Kos, Rhodes, Zante and Menorca each get an extra weekly flight and Palma de Mallorca gets 2 extra weekly flights. Dalaman goes down from 3 weekly to 2 weekly. Total of 45 weekly departures. Naples, Dubrovnik and Enfidha are new routes while Hurghada goes year round. On the holiday website there are also holidays available for Montenegro using the Dubrovnik flights. On Friday 1 aircraft does a W pattern to Corfu for Bournemouth. In all it's 90 weekly flights with 17,010 seats on sale compared to 72 weekly flights and 13,542 seats onsale for summer 2018. So 9 extra departures a week from TUI. A good week for BHX in respect of prospective 2019 based airlines. TUI 2019 the 8th based aircraft for the short-haul operation is required although one of the new routes, Split is not bookable on any platform. Long-haul is just the one based 787. Announnced by BHX as 11 based and 41 destinations but the schedule shows 12 based in the afternoons as well as away based Palma on 6 days. Summer destinations show 39 so expect a couple more to be announced at some point. Passenger figures Both January and February were down around 5% each month and the snow closure affected March as it looked that they might have been positive. Does anyone know which airports the Sunwing/TUI Boeing 737s will be based at this year and any other airports that they will visit on W patterns? The inaugural Qatar Airways flight for Cardiff Airport on Tuesday 1st May 2018 will be on an A350 900 and will arrive at 12.50 and depart at 15.55. Interesting to note flybe have been operating from LHR for over a year now. Many thought this route would get scrapped after a short period of time, has anyone used this service and has got an idea of the loads? Have used the LHR-EDI leg a couple of times,... LF around 50% each time I used it..
Cardiff Airport continues to grow. Stats for March 2018 from the airport. 96,767 passengers passed through the airport up 11% on 2017. The rolling year was 1,488,000 up 10% on 2017. Called in to fix a schedule change on a mixed Delta/KLM itinerary. The schedule doesn't show it yet, but apparently KLM is preparing to axe the 0900 AMS-NWI flight. Disappointing, since I was relying on having that morning. That means the earliest flight from AMS each day will arrive at 1340. Air India are adding a third weekly BHX-ATQ on Saturdays from 5/5/18. Air India will now be x8 weekly with x5 BHX-DEL-ATQ and x3 BHX-ATQ-DEL. Apparently it might soon be x10 weekly although not sure which flight gets increased. the delayed EZY timetable launch for GLA apparently is a damp squib with 'rearranging the deckchairs'... anyone heard anything else?